It isn’t always eternal summer on the trail, though memories might make us think so. Winter is my favorite season to paint. I love the subtleties of color and shape with snow in the air and on the ground, and on the trail I am often all alone with the quiet of a winter day, or a gentle quiet snowfall. Each Christmas day since the year my mother died I’ve taken the day to spend in the quiet peace of nature on the Panhandle Trail. After the busyness of the holiday season as a graphic designer and a merchant it’s a day to let all the work of the year pass behind me and begin a new year with my own creative vision. It’s a day of contemplation and often I do a sketch or two, always take a few photos, sometimes take the time to do a little writing on the trail or when I come home, even if the weather is frigid, or wet, or deeply overcast. This year it looks as if we might actually have snow, which will be a welcome change from the overcast days of the past few years. In this case, I was glad for the time alone and quiet, and my art materials. This is from several years ago, one of the sketches I’d actually done in the front seat of my car during a late winter ice and snow storm, with a personal connection. I’d moved my mother to a personal care home in a neighborhood adjacent to the trail and often combined visits to the trail and visits to my mother. She didn’t care at all for trails, but she thought it was pretty cool when I would pull up in front of the home on my bicycle in shorts and a tank top to visit and cool off and eat my lunch on a summer afternoon when all the other daughters were in jogging suits driving minivans. Though my mother suffered from a number of heart and lung conditions she was overall well but weak, though she often suffered from mild dementia; visits could be troubling. So it was this winter day when I had driven there. The roads were cleared but the trail was not, still, I wanted a dose of nature after my visit and knew of a spot close where I could pull up next to the trail. Not a mark was in the deeply fallen snow, and I decided I would not be the one to leave mine, it was just too perfect. The snow was falling too heavily to work outside my car, so I angled my car just right and sat in my font seat and began a sketch, then decided I should leave before the roads grew worse. 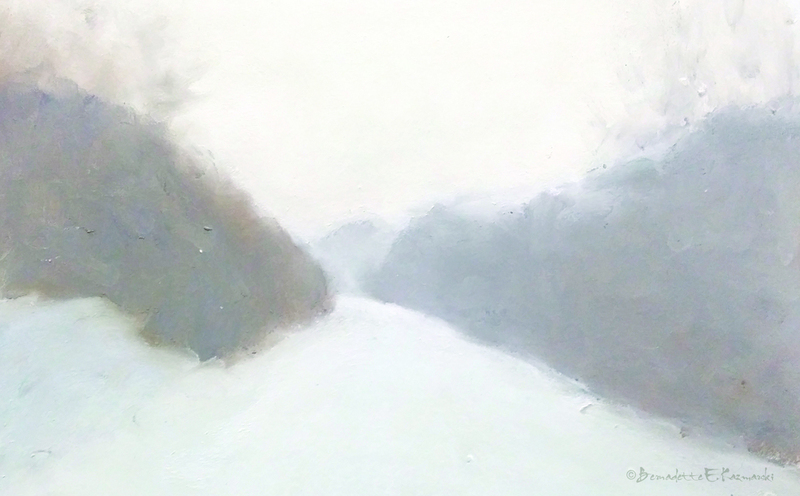 I’d always intended to finish this off, adding some bare trees fading into the distance in the heavy snowfall, but I think there was a reason I stopped at this point, and I think it captures this snowy afternoon and my conversations with my mother as it is. “Snowfall” was part of my August 2014 exhibit “Sun Shadow Ice & Snow: Seasons Along the Panhandle Trail”. I’ve been visiting the Panhandle Trail for nearly 15 years with my bike and on foot, for exercise and inspiration, more inspiration than exercise, packing in with backpacks of camera equipment and art supplies. I’ve taken thousands of photos along the trail and off in the woods, but I’ve also done a number of sketches while there in pencil, charcoal, pastel and watercolor, and arriving home in my studio to do more from photos. “Snowfall” won in the second highest award category, “Award of Excellence”, in the South Hills Art League annual juried show. I don’t keep giclee prints in stock for most of my works. Usually I have giclees printed as they are ordered unless I have an exhibit where I’ll be selling a particular print so there is a wait of up to two weeks before receipt of your print to allow for time to print and ship. All are countersigned by me. See other landscapes in my gallery of Landscape Artwork and also see other winter paintings in my exhibit Winter White, and trail artwork from my annual Seasons Along the Panhandle Trail exhibit. This entry was posted in landscapes, pastel, Seasons Along the Panhandle Trail, Winter Holidays and tagged panhandle trail, pastel painting, winter, woods on December 25, 2017 by Bernadette.